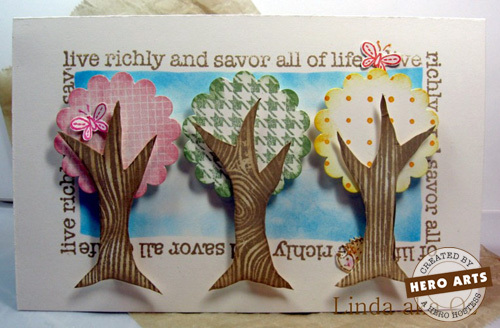 Hero Hostess Linda Metteer used background stamps in a fun & unexpected way! Mask off the front of your card base with re-positionable notes and sponge in a blue chalk ink for sky. Stamp the sentiment all around the sky using Hero Hues chalk ink in Latte. Stamp the Hounds tooth, Raindrops and Screen Shadow in 3 different colors on card stock, then punch a scallop out of each. After sponging the edges of the scallops with the same ink colors they were stamped in, adhere them to card with foam dots. Stamp a wood-grain texture using Hero Hues chalk ink in the Latte color. Cut out 3 tree trunks and sponge Latte on the edges. Adhere these to card with foam dots also. Tuck in a few critters around here and there as an unexpected surprise. Use message stamps to create a unique border or frame.